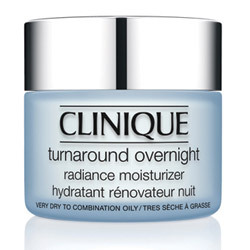 As with all Clinique products, the packaging of Turnaround Overnight Radiance Moisturizer is classic and sleek. I liked that it was suitable for all skin types, from very dry to combination oily. The scent of the product was quite off-putting. I've tried quite a few Clinique products previously and like that they tend to be fragrance-free or at least, not offensive but I struggled with this one, which smelt very synthetic. Clinique Turnaround Overnight Radiance Moisturizer has a thick texture which lent itself well to a massage application. I found that it took a while to be absorbed but once it was, there was no greasiness. When I woke up, my skin still felt nourished and the texture improved as a result of the hydrating benefits, however, I struggled to notice any dramatic difference to the overall appearance of my skin. I might be tempted to repurchase this if Clinque were running one of their "Bonus Time" offers and I certainly used up the product, however, I probably wouldn't pay more than £20 for it so I was surprised to hear that it's £34 for 50ml.